Chef Hats. 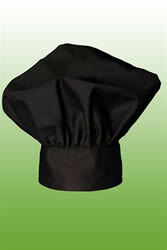 High Quality Chef Toques and Berets made in America. No chef's uniform is really complete without a proper chef hat. This is a variation on the classic toque – it's a slightly "floppy" toque. Not quite as formal, but every bit as professional. It's made out of the great fabric, Ultra PC 3000, that wicks away moisture, is stain resistant and durable. This is an easy care hat – simply throw in the washer and dryer, shake it out and it's good to go! There's an adjustable velcro closure in the back, which allows this hat to fit any size head. Style, affordability and a made in the US garment all in one – very nice! Read more about the hats. 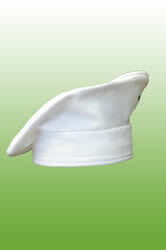 When you'd like your chef clothes to be color coordinated, consider purchasing both a white and black chefs hat. This one looks great with Houndstooth pants and a white jacket. It's made from the excellent Ultra PC 3000 fabric, which means that you can throw it in the washer and dryer and it will come out looking great. This is a durable 65/35 poly cotton blend twill fabric. This floppy toque style hat has a velcro back closure, allowing it to fit any head size. The cost of looking professional is very affordable, at last! Read more about the hats. Great chefs hats don't have to be expensive! 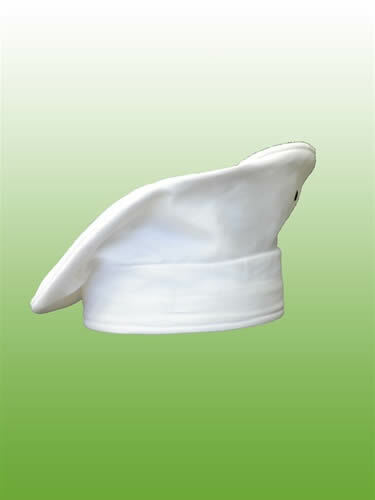 This beret style chef hat is a crisp white. The fabric is the ultra durable, ultra easy to clean fabric – Ultra PC 3000. This is a 65/35 poly cotton blend twill that will take the hassle out of keeping the hat clean and new looking. This is a one size fits all hat fitted with an elastic head band. Inside, the headband is lined with a soft and absorbent terry cloth – keeping your forehead dry and cool. Read more about the hats. 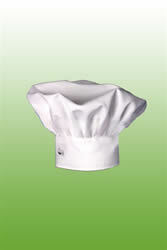 * Love these chef hats but live outside the US? Contact us, tell us where you live and what you want to buy and we'll send you an exact shipping quote.